China plans to perform its first manned space docking operation this year, with the Shenzhou 9 capsule and three crew members due to be launched between June and August. Following what national space contractor CAST calls the thoroughly successful Shenzhou 8 unmanned and automated docking trial last year, the Shenzhou 9 crew will use manual control to join their craft. “Astronauts will enter and stay in Tiangong 1, carrying out space science experiments,” CAST says, citing a spokesman for the manned space program. The statement contradicts recent reports that Shenzhou 9 would be launched without a crew. That had always been a possibility if Shenzhou 8 did not perform its mission smoothly, Chinese space leaders have told Aviation Week, but a comprehensive assessment has determined that conditions are right for a manned docking mission. Indeed, the decision to send a crew in Shenzhou 9 backs CAST’s statement that Shenzhou 8 was successful. Shenzhou, pronounced “shen-jo,” means “divine craft” and is a homonym for an old name for China (“divine land”). -- Feb. 19, 1960: China's first liquid-propellant rocket was launched from a paddy field near Shanghai. -- April 24, 1970: First artificial Earth satellite, Dong Fang Hong-1 Satellite, was launched from Jiuquan Satellite Launch Center as China joined the former Soviet Union, America, France and Japan as the fifth country to launch satellites. -- Nov. 26, 1975: The launch and recovery of the first recoverable satellite makes China the third country to master this technology. -- October 1986: Chinese top leadership approved the "Program 863," a national hi-tech initiative under which scientists began researching manned spaceships. -- 1992: the Chinese manned space program was officially adopted. -- From 1990 to 2002: China launched four unmanned spaceships (Shenzhou-1 to Shenzhou-4), laying a solid foundation for future manned spacecrafts. -- Oct. 15, 2003: The launch of its first manned spacecraft, Shenzhou-5, sent one astronaut into space. The 21-hour flight allowed China to become the third country to independently conduct manned space flights, following the Soviet Union and the United States. -- Oct. 12, 2005: Shenzhou-6 manned spacecraft was launched, sending two astronauts into space. -- Sept. 28, 2008: China launched Shenzhou-7 spacecraft with three astronauts on board. One of them carried out a historic first spacewalk, and China became the third country in the world able to conduct extravehicular activity in space. -- Sept. 29, 2011: China launched its first space lab module Tiangong-1, which has been unmanned. -- Nov. 3, 2011: Unmanned spacecraft Shenzhou-8 successfully docked with Tiangong-1 space lab module, after it was launched on Nov. 1, 2011. Tiangong-1 will await Shenzhou-9 and Shenzhou-10 in the next two years. Will Italian Astronauts Fly to a New Chinese Space Station? Italian Space Agency (ASI) President Enrico Saggese was in Beijing on Wednesday to sign a cooperative agreement with China National Space Administration (CNSA) President Chen Qiufa. The deal covers science and exploration, space transportation, Earth observation, telecommunications, satellite navigation, and education, according to an ASI press release. BEIJING, Nov. 13 (Xinhua) -- China has established an operation committee for management of the country's first space lab module, Tiangong-1, during its two-year orbit of earth. The committee will deal with operations planning, technical appraisal and flight control of the target orbiter after the unmanned Shenzhou-8 spacecraft returns to earth after its mission, the official website of China's manned space program said. The Tiangong-1 space lab module was launched on Sept. 29 and docked with Shenzhou-8 precisely on Nov. 3, China's first ever space docking attempt. 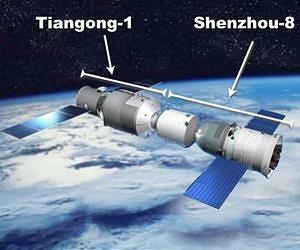 The second docking between Tiangong-1 and Shenzhou-8 is scheduled for Nov. 14. The manned space program said earlier that the same target orbiter Tiangong-1 will accommodate another two docking missions performed by two other Shenzhou spaceships, at least one of which will be manned. The 8.5-tonne Tiangong-1 is the first space lab module that China has built, and the committee will also be the first in taking care of a long-running space asset. The operation committee for Tiangong-1 heralds China's manned space program entering a new phase for lengthy flight missions, Niu Hongguang, director of the operation committee, said on the website www.cmse.gov.cn. The orbiting module management will include taking care of the space lab, making preparations for any further docking tests and gathering experience for building a future space station, Niu said. Congrats to China on the launch of Shenzhou-8, which lifted off from the Jiuquan spaceport in the Gobi Desert at 05:58 local time on Tuesday 1 November. The capsule will rendezvous and dock with the Tiangong-1 module in a few days. The two craft will remain docked for about 12 days while various Chinese and German science experiments will be performed, before Shenzhou undocks and returns to Earth. Onboard TV cameras relayed the launch, including the full 10 minute ascent to orbit, and the footage is pretty cool. We definitely have not seen this before from any Chinese rocket launch - probably because this is an unmanned mission and there are a lot more cameras onboard this time: on the side of the rocket stages, outside the capsule, and inside the (empty) capsule. This all comes from the CCTV feed, but from their English language channel so it has English language commentary. The coverage begins about a minute before launch, continues through ascent (including booster separation), fairing jettison, and solar array deployment. SInce we won't be seeing any live Shuttle launch feeds, this is the best we're going to see for awhile. Enjoy.